Submitted by tessa on Sat, 08/21/2010 - 18:17. The author speaks of the Agricultural Land Reserve and policies to create density as something that drives up unaffordability, but I think that misses the mark. The ALR creates dense, walkable neighbourhoods, to the point where most people don't need to own a car. That saves an amazing amount of money: $1000 or so for annual insurance costs, and for a new car you're talking a lease of likely at least $3,000 a year, or similar costs if you're paying via financing. That's not even mentioning gas. Really, it's the overall cost of living that we ought to be measuring, not just housing, as it doesn't tell the whole story. Also, you talk a lot about "liberalizing" (eliminating) land use controls, but you don't once mention that the vast majority of land in Vancouver and the suburbs are zoned single family residential, which prevents anyone from densifying those neighbourhoods into much more urban development. 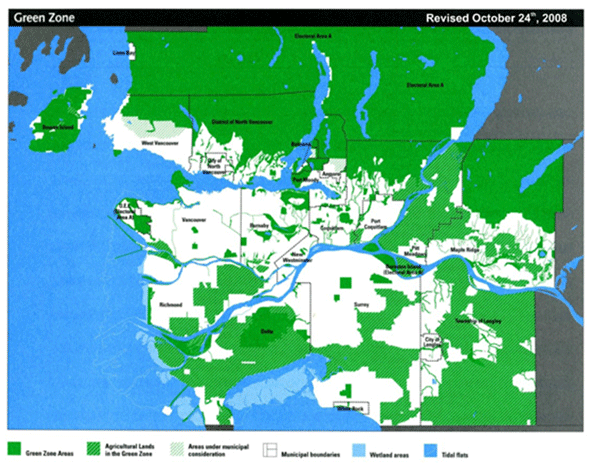 If you simply rezoned those areas to allow for a much wider variety of development, ranging from single family homes with secondary suites to low and mid-rise apartments, the affordability problem would likely disappear relatively quickly, and we still would be able to save money in other areas such as transportation. We could also focus on so-called third tier housing, something that is not exactly homeowner or rental, but areas where the city owns the land and you lease the property (as is done in False Creek South), or non-profit housing providers. Vancouver has a huge number of cooperative housing buildings that were built largely in the 70's, and are still some of the most affordable housing in the city. I agree that Vancouver has a housing crisis, a very serious one, but abandoning density and the ALR for urban sprawl throughout the valley isn't going to solve the problem, and it certainly isn't going to keep the region as somewhere that's worth living. Submitted by PhilBest on Fri, 08/27/2010 - 22:01. Firstly, Tessa, see my comment below about "Density Profiles and Social Justice". High land costs DEPRIVE low income earners of the choice of trading off mileage and mortgage payments - they don't ENABLE this choice. You can see that Vancouver has a serious housing crisis. If you want to know what are the logical conclusions of your planning preferences, take a look at England, where they have been in force since the 1947 Town and Country Planning Act. Floor space per person; lowest in the OECD, below Japan. Average age of a first home buyer: 38 years. Social housing: extremely costly to taxpayers and stressed by a shortage currently in the millions. Social mobility, low; prospects of property ownership, low; social alienation, high. See also my comment, "The Big Picture", below. Submitted by Steve Lafleur on Mon, 08/23/2010 - 12:53. I agree with most of your argument. I like dense, walkable communities. I'd like to see the city gradually allow development in the ATR, while zoning it for high density. Submitted by neil21 on Sat, 08/21/2010 - 14:14. Apparently everyone was upset that they built the tube (Canada line) out to areas where no-one lives, rather than into the middle of pre-existing burbs. This is apparently so they can build new dense mixed-use areas around them. I like that thinking. Wow -- a great success story! Submitted by john1 on Fri, 08/20/2010 - 17:15. Very good article. It definitely shows the strong desire people have to live in a "dense mixed use development," as the article shows. People are hungry for this kind of development, and people are willing to pay a great deal of money to live there. New Geography is providing a service to developers and urban planners everywhere who should take note: dense, mixed use development is a hit! And, moreover, this type of success should not be out of reach of middle class and all people. We should encourage, allow, and nurture this living pattern everywhere. With more supply of this in-demand living arrangement, no doubt the price would come down, and people of all income levels can enjoy dense, mixed use developments. Policies should be in place to encourage it, and subsidies for sprawl and suburban developments should be ended. I salute New Geography for its advocacy of dense, mixed use developments and their high degree of desirability! Submitted by docwatson on Fri, 08/20/2010 - 17:03. Abandoning the growth boundary will not make housing in desirable Vancouver any cheaper, while housing in far suburbs across the Fraser River is already reasonably-priced. Sprawl may at first make housing cheaper on the periphery, but eventually you end up with terrible traffic congestions and as you push the limits of how far people can commute, home prices go up anyway. I believe the region can encourage enough multi-family housing to be built in sufficient quantity to meet rental and condo demand. For households desiring a single-family type of living situation, allowing compact or row housing in sufficient quantity to meet market demand, in locations within walking distance of transit, is the best solution to provide affordable alternatives. 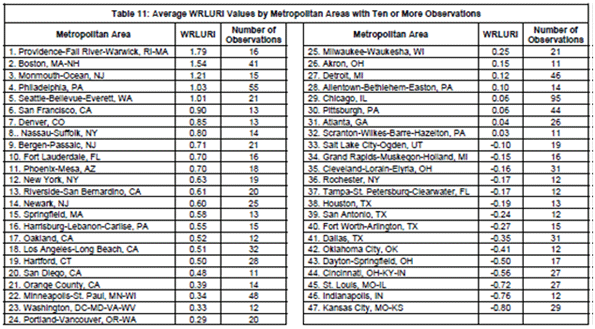 This is after all a major metropolitan area. Once you hit several million population, the idea of everyone living on the quarter acre and driving everywhere becomes untenable and unaffordable, but too often we use zoning regulation to push this living style, driving up costs. Submitted by tx1234 on Fri, 08/20/2010 - 16:11. In all seriousness Vancouver sounds like a carbon copy of the San Francisco Bay Area. I should know because I live in the Bay Area. I've been here for 11 years and moved from North Carolina. Thus my perspective is one of cynicism seeing as how a pretty nice house in a nice neighborhood in North Carolina- which doesn't have half-bad weather and somewhat mild winters- will cost you $200,000 or less. In fact, one of my friends back there bought an older house for $89,000 recently. The same home in the Bay Area would be around $550,000, if not more if its in a "good" neighborhood with (gasp) actual functioning public schools. The general attitude of the small Bay Area town I live in is that any and all new housing is a BAD thing and that lord help us all if anything new is built because as we all know, more housing would just totally ruin the quality of life for everyone. If any actual plans come to fruition which these days includes such fantastic layouts of communities with "walkable" neighborhoods, rail lines, bicycle lanes, and mixed-use housing, again- the local community balks and nothing is ever built. Instead what we have is a beautiful neighborhood filled with quaint old houses that all have enormous price tags that nobody can afford. Well- I guess some can afford because people somehow still buy them, which is a mystery to me because my wife and I make a healthy 6-figure income and for us, buying here would be astronomical. In North Carolina the state almost bends over backwards to get land developers and companies to relocate or build there. They're building houses in every former tobacco field and on every former farm. HUGE gigantic houses slapped up as quickly as possible. This is surrounded by a fleet of fast food and chain eateries, big-box stores, and so on. On the other hand the surrounding towns and cities are filling up with your typical brand of gentrified entertainment in the form of art galleries, microbreweries, wine bars, and the occasional Japanese restaurant. As you can tell I'm somewhat bitter about the whole thing. It is aggravating to me that at one time, ordinary people with regular jobs could afford to live just about anywhere they wanted in the US. Its hard to imagine that San Francisco was once a longshoreman's town. Now its basically a playland for the old folks who got here first and the rich who drive their bimmers up and down 101. Submitted by tx1234 on Fri, 08/20/2010 - 09:45. Ok, so basically it sounds like the main reason Vancouver is so expensive is because its the only Canadian city that doesn't have absolutely crappy weather in the winter. It appears that in general the weather is about as good as you might find in roughly 70% of the US, yet since its in Canada and if you're a Canadian you have few choices for living in a city with halfway decent weather, Vancouver is it. Sounds totally like the California of Canada. Submitted by Steve Lafleur on Fri, 08/20/2010 - 13:49. Like I said, it's a naturally expensive market. Having said that, preventing development has made the situation worse. There's basically a fixed supply of land, and increasing demand. Submitted by epar on Fri, 08/20/2010 - 09:10. 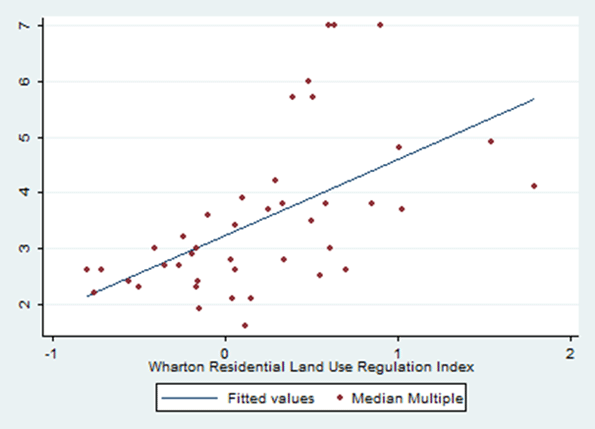 You make a pretty strong case for how urban growth boundaries raise housing costs. But before we can conclude that this effect alone should discourage us from adopting Smart Growth measures, its worth considering the costs of low-density suburbs. So suppose Vancouver were to adopt the policies its American counterparts did in the mid-20th century, and fully support fringe development? Well, for one, new highways would have to be built. In addition to the direct construction costs of such an endeavor, extremely valuable urban land would have to be acquired and cleared. The noisy and intrusive infrastructure would harm land values (although I suppose making a place undesirable is one way to make it affordable). The new suburbanites would require new infrastructure and rely more on their cars to drive longer distances, raising transportation costs. More sedentary lifestyles resulting from more time behind the wheel leads to higher public health costs. As automobile infrastructure comes to dominate the landscape, traffic congestion spurs a wave of NIMBYism that leads to low-density zoning, which can inflate housing costs just as much as UGBs. These costs may be harder to quantify but that doesn't mean they can be safely ignored, either. 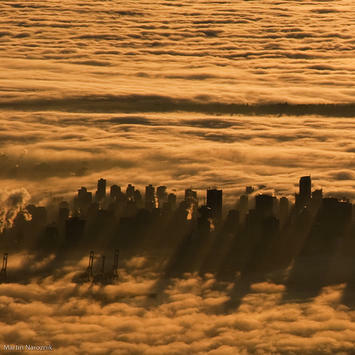 I think what you're really saying about Vancouver is that its suffering from its own success. Natural geography, economic factors, and smart planning has made it an attractive and vibrant city. You can hardly fault its political leaders for creating a place where people want to be. You would have them accept the false choice of exlcuding the middle class or allowing sprawl. But why should compact living and a middle-class income be mutually exclusive? After all, all else being equal, living on less land is more affordable. Instead of adopting the American suburban model, which would damage the very qualities that make it attractive, Vancouver should find more innovative ways to address its affordability problem. Maybe it can expand its secondary suite zones. It could also selectively extend its grid into the least agriculturally productive or environmentally sensitive land. 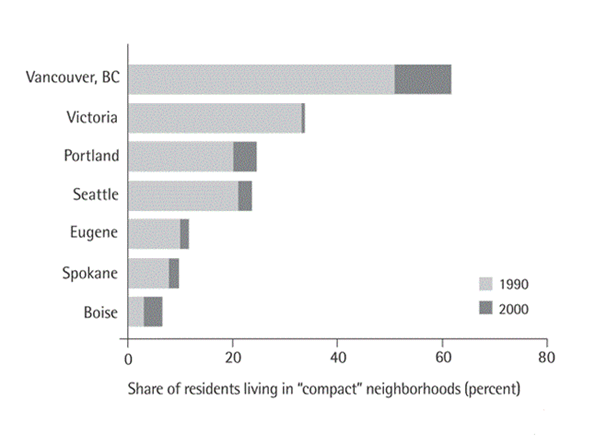 By investing in transit infrastructure, the city can accommodate higher residential densities. Point is, there are plenty of ways to expand the housing supply without incurring the costs of American-style suburban development.